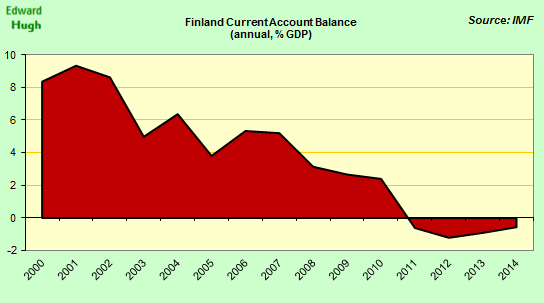 Edward.Hugh.Blog: Is Finland's Economy Suffering From Secular Stagnation? 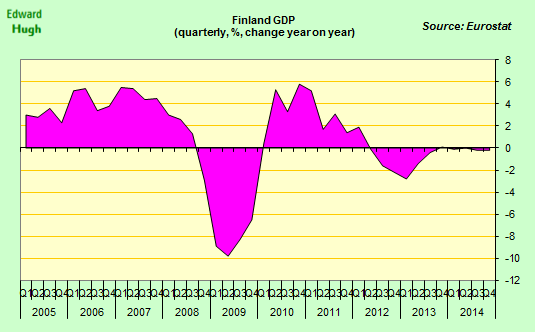 Is Finland's Economy Suffering From Secular Stagnation? 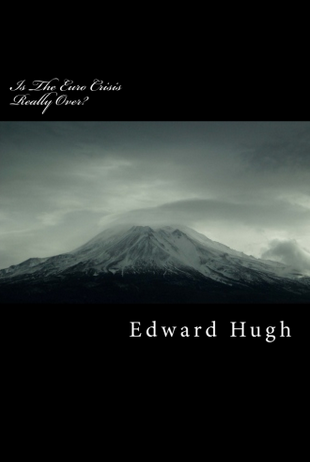 "After the Great Depression, secular stagnation turned out to be a figment of economists’ imaginations........it is still too soon to tell if this will also be the case after the Great Recession. However, the risks of secular stagnation are much greater in depressed Eurozone economies than in the US, due to less favourable demographics, lower productivity growth, the burden of fiscal consolidation, and the ECB’s strict focus on low inflation." 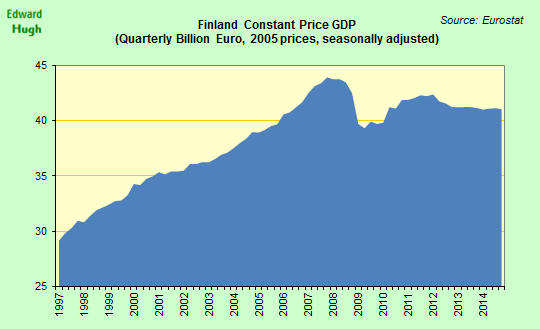 Finland's economy has been attracting a lot of interest of late. And not for the right reasons, unfortunately. The economy in a country previously renowned for being highly placed in the World Bank's "Ease of Doing Business Index" has just contracted for the third consecutive year. Once famous for being a symbol of "ultra competitiveness" (it came number 4 in the latest edition of the WEF Global Competitiveness Index) the country is now fast becoming the flagship example of another, less commendable, phenomenon: secular stagnation.The origins of the theory of secular stagnation go back to the US economist Alvin Hansen (see here) who first used the expression in the 1930s. The hallmark of secular stagnation, he said, was a series of sick "recoveries which die in their infancy and depressions which feed on themselves and leave a hard and seemingly immovable core of unemployment." This seems to fit the Finish case to a T.
After the global crisis the economy seemed to recover, but after the second Euro Area recession the country's economy hasn't been able to lift its head again. In fact GDP still languishes about 5% below the 2008 peak. Unemployment, on the other hand, has remained stubbornly high, and - at 9.1% - has recently passed just above the crisis peak. Hansen surmised that the big driver of US economic growth prior to the 1930s had been population growth. Given the fact that he expected US population to fall he, not unrealistically, came to the conclusion that "We are thus rapidly entering a world in which we must fall back upon a more rapid advance of technology than in the past if we are to find private investment opportunities adequate to maintain full employment. ..."
He thought technological advance could stimulate investment to fill a gap left by the lack of natural investment growth. Following Adam Smith he recognized that the "rate of investment" is conditioned by the extent of the market (or rather the rate of expansion of the "extent of the market"), but if population was falling rather than rising then the incentive to invest like before wouldn't be there, since the market wouldn't be increasing in "extent". So technology and innovation became more, not less important, just like the situation we face now. Hansen was wrong about the demographic dynamics - he didn't foresee the post war baby boom, but then neither did the demographers he relied on. (For more on this see Richard Easterlin,"The American Baby Boomin Historical Perspective", 1962). But if we look at the situation we face today there is a lot less uncertainty about the population outlook over the next 10 to 20 years, especially when it comes to working age population dynamics. From the experience in Japan it seems it is working age population and not total population that really matters in terms of macroeconomic effects. 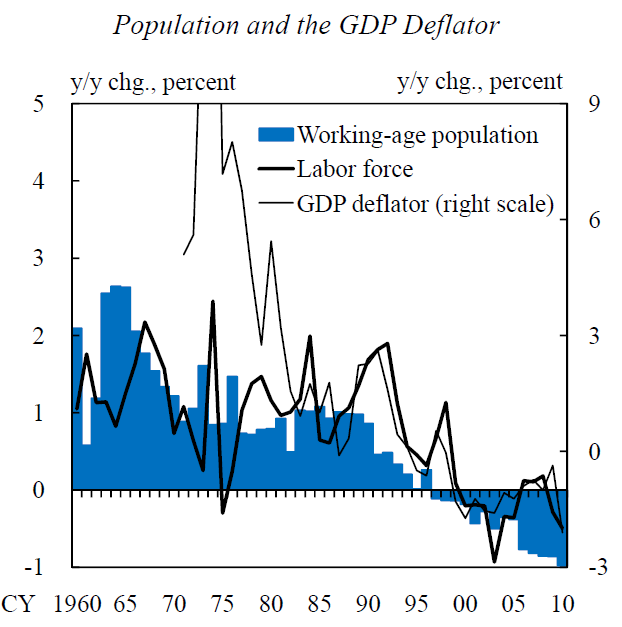 Declining inflation/deflation correlates much more strongly with working age population dynamics than it does with monetary policy. (See Bank of Japan former Governor Masaaki Shirakawa here). 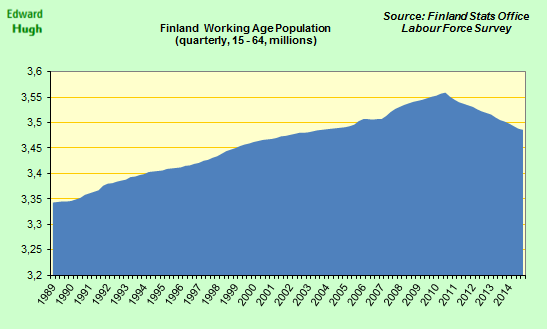 In fact, Finland's working age population peaked during 2010, and it has since been declining rapidly. So it fits the picture described by Hansen admirably. 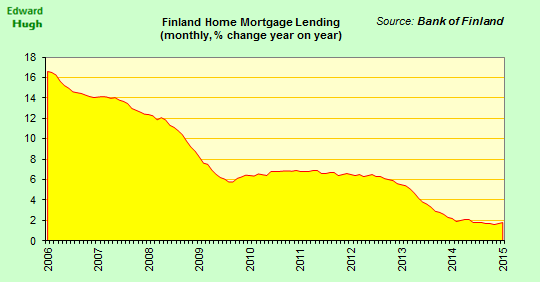 And indeed the Finnish economy is now starting to flirt with deflation. "Finland’s economy has fallen behind its Nordic neighbors and euro peers, in what Prime Minister Alexander Stubb has called a “lost decade.” Pay increases are on hold after a wage boom during Nokia’s glory days opened up a salary gap of about 20 percent with the country’s main trading partners, Sweden and Germany. “We need to bridge the cost gap with our competition,” said Jyri Hakamies, who heads the Confederation of Finnish Industries, the main business group. “That will take years. At the same time, labor agreements must be made more flexible and productivity must improve to kick-start economic growth and create jobs”"
In 2007, when the countries export-led technology industry was booming workers representatives hammered out an 8.5 percent wage increase that was implemented over two years. That deal led to an upward spiral where other industries and then the public sector pushed for ever higher compensation. As a result of agreements like these unit labor costs have been growing sharply for more than a decade. They diverged from levels seen in Sweden and Germany in 2007, just as the woes of Nokia and the paper industry intensified and exports slumped. Since 2008, Finland has lost competitiveness against all EU countries as its wage costs have rocketed. 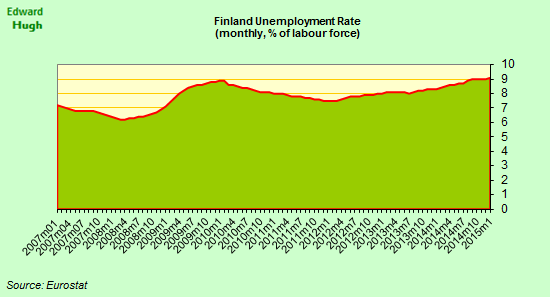 As the unit labour costs of Ireland and Spain have fallen, Finland’s have increased by about 20 per cent. Productivity has suffered correspondingly. The Conference Board calculate that from 2007 to 2012 Finland’s unit labour costs in manufacturing rose by 6.3 per cent a year, faster than any of the countries surveyed except Australia and Japan. At the same time, Finland’s productivity fell by 3.9 per cent a year, far more than in any other country. Richard Milne (in an FT Op-Ed) produces the following chart to illustrate the situation. The chart is slightly misleading, illustrating just one more time how there is no such thing as an economic "fact", since he has rebased the index to 2007, just when Spanish unemployment started to rise much more rapidly than measured GDP fell, provoking a substantial downward adjustment in ULCs. 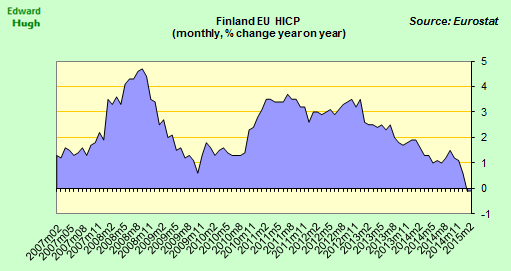 So Spanish and Finnish ULCs have seriously parted company, but not by as much as the chart suggests, since in 2007 Spain's ULCs had grown to absurdly high levels. 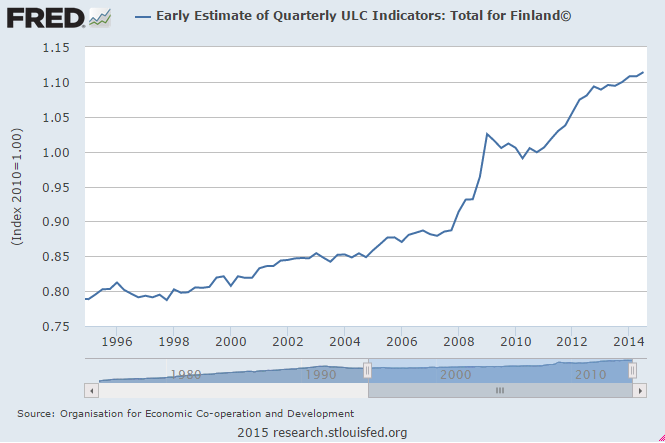 Just to illustrate how in a pre-scientific, ideologically divided discipline like economics there are no (consenual) facts, only interpretations, I have rebased the ULC data to 2000 in the chart below. This still shows how serious the Finnish situation is, but puts the Spanish development in a rather different light. Finland wasn't THAT uncompetitive until 2011. In fact Finland has transited from being a country with a significant goods trade surplus, to being one with a structural deficit. Even the current account balance has now turned negative. 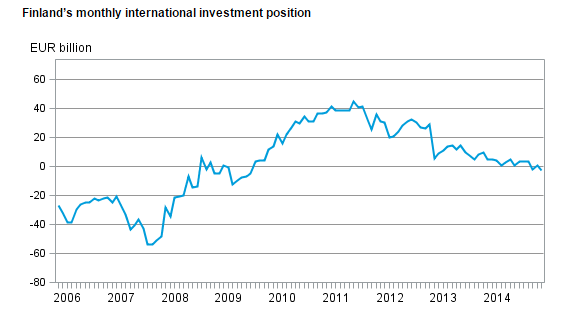 And the country's Net International Investment Position is also turning negative. This is an especially worrying phenomenon in the case of a country with a rapidly rising elderly dependent population, as income from external investments can help maintain living and welfare standards. Net negative income payments will only leave less money available for social policies. As in earlier similar cases, the loss of competitiveness and export prowess was compensated for in the short run by a modest consumption and housing boom. House prices rose sharply - possibly helped by the availability of low interest mortgages driven by ECB monetary policy - from 2008 to 2013. 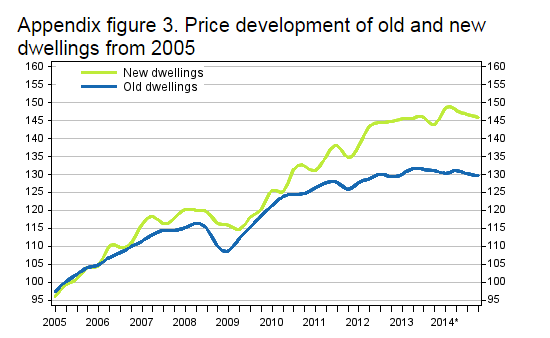 But now prices have begun to stagnate, and even decline slightly. 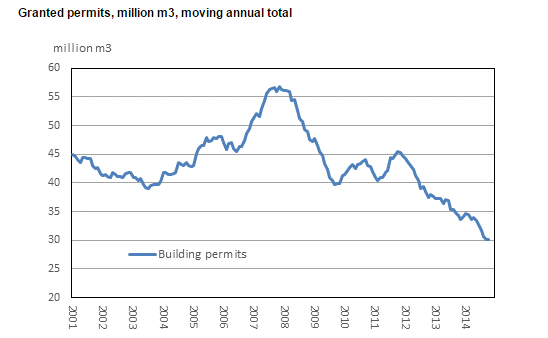 The number of building permits issued has slumped. While the rate of demand for new mortgages has been steadily dropping off. What To Do About The Situation? The whole topic of secular stagnation is a highly controversial one at the present time. In the first place there is no general agreement that this is what is affecting a country like Finland. Those, like Prime Minister Alexander Stubb would argue that it is simply a question of the country having lived beyond its means, and hence lost competitiveness. Thus, in his opinion, what it now needs is a lengthy process of internal devaluation and austerity. Curiously - in a country that was busy recommending sharp austerity to others - he blames rising debt and lax fiscal policies for the situation. Finland's economy could flat-line through the 2020s, he suggests, if politicians fail to curb taxes and government debt. The government debt of Finland has almost doubled since 2008, from 28 percent of gross domestic product to 48 percent at the end of 2014. Taxes have risen 3 percentage points over the same period as different administrations tried to preserve benefits without resorting to deep cuts. The jobless rate this year will rise slightly to over 9.1 percent, the government estimates. GDP languishes below its 2008 level - Bloomberg News. 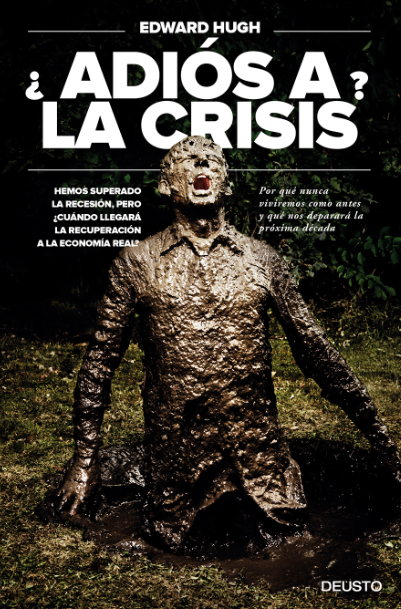 Certainly, having not adequately analyzed what was happening, the country has been running a series of fiscal deficits which continued beyond the crisis as the momentum provided by the housing boom has waned. Naturally, with no growth and low inflation the government debt level has been rising rapidly.The level is still low - the IMF forecast it will hit the 60% of GDP EU limit this year - but if it continues rising at this rate it won't stay low for long. Another hypothesis could be that of a balance sheet recession, but with government debt under 60% of GDP, and total private sector debt only around 100% GDP, this hardly seems plausible. Neither, for the same reason, does the idea that the country is simply trapped in a liquidity trap. 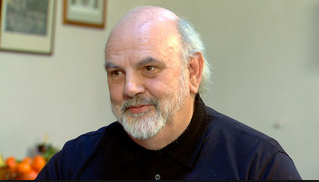 "I need to work a lot more on the mechanics of this paper; I’m wondering in particular whether there is a possibility of sustaining the economy with permanent fiscal expansion." At first sight the idea of permanent stimulus seems weird, especially given the fact that it won't stimulate (in the normal sense) and also due to the longer term debt implications. But then, the possibility exists that secular stagnation is associated with constant deflation, in which case the central bank could print money for an extended period of time without causing inflation. I explore this possibility in my piece EuroGroup - Money For Nothing And Your Debt For Free? Leaving the Euro - which I think no one is suggesting - wouldn't be an advantage, since apart from losing the firepower of a large central bank for the debt scenario, the country would be unlikely to achieve meaningful devaluation. All the other Scandinavian countries are currently having to fight hard to avoid revaluation - largely due to being neighbours of the ECB - as I explain in my post on negative interest rates. The old debate about having monetary policy sovereignty is a bit out of date, especially at a time when even Janet Yellen is hesisitating to raise rates due to concerns about the currency impact of ECB action. How much more would a small open economy like Finland be at risk? Is There A Temporary "Free Lunch"
Nothing ever comes entirely free, and one of the issues which arises with permanent QE is that it may be applied only at the cost of generating bubble type problems elsewhere, and issue which I look at in Secular Stagnation - On Bubble Business Bound. But developed economies are in a bind, and they do need to find some path to move forward along. Larry Summers - who was the first to use the expression secular stagnation in the current context - advocates infrastructural spending to overcome the investment shortfall, but I'm still not sure whether he recognises that this spending would need to become permanent, so we still end up with mounting debt. The Catalan economist Jordi Galí makes a similar proposal to the one Summers proposes, but again with a limited stimulus objective. However in one sense he does go farther. 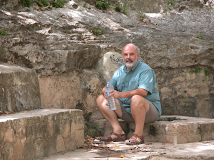 In "Thinking the unthinkable: The effects of a money-financed fiscal stimulus" he argues that the proposals he advances "contrast with the experience with quantitative easing and other unconventional monetary policies, which do not affect aggregate demand directly and which, as a result, have failed to jumpstart the depressed economies of many countries, especially in the Eurozone." He goes on to say, "An additional advantage of a money-financed fiscal stimulus, particularly relevant for a monetary union, is that the associated increase in government purchases may be targeted at the regions with higher unemployment and lower inflation (or higher risk of persistent deflation)." At the end of the day, only two things can be said with a fair degree of certainty: short term fiscal austerity won't make any significant improvement to Finland's situation, and it could help make things worse (this whole discourse is based on a misunderstanding about what the problem is) while, on the other hand, what short term stimulus won't do is stimulate. Structural reforms - aimed to increase labour market participation rates, and extend working lives - can help. So can measures to improve the quality of education, and the effectiveness of investment into new technologies. But if we look at Japan, even these offer no simple panacea. Finnish society, like many other European ones, is in the throes of a major transition. More debate needs to be held on what to do to facilitate the transition, and in the meantime deficit spending to make investments in future productivity improvements seems not to be a bad idea. 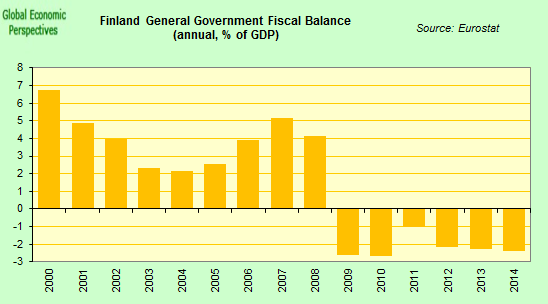 Running deficits in order not to change, in contrast, would be.